It had been a challenging week. An in-box boiling over with hundreds of messages. Frustrating meetings followed by meetings about the frustrating meetings. Everyone was rushing to tie up all of the loose ends before the holiday break and the the internal alarm clock rang–time to close the office a few hours early so that everyone could step back and unwind for Easter. As I stepped off of the elevator after lunch to pick up a few things I was still multi-tasking, juggling loose papers from the car, an open purse, a trailing shawl and a ringing cell phone. It was my friend, Elizabeth. I was struggling down the dimly lit corridor toward the office while answering the phone, when I saw someone standing at the end of the hall outside the office–it was Elizabeth calling to see where everyone was. She had taken time from her busy day to stop by the office with a gift, a beautiful basket of yarn that she had purchased at a fundraising event in Minneapolis. 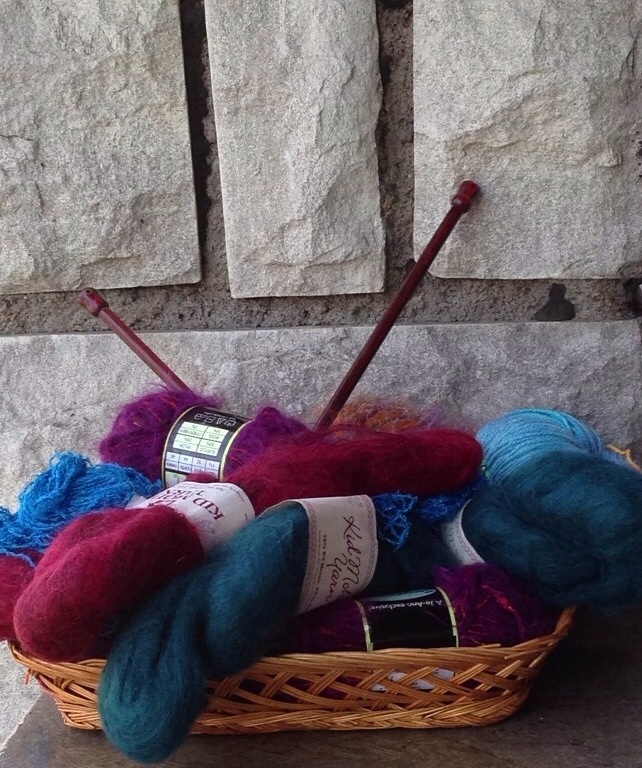 The rich garnet and woodsy teal mohair skeins were a soft nest for carefree turquoise cotton. And in the middle of all of it, sleek number ten wooden needles with a rainbow grain. I was already thinking of the relaxing knitting that was ahead. My gratitude was not only for the simple gift, but for the joy of being remembered by a good friend. How can I be a gift to my friends? Can I take time to make a small gesture that can turn around a day for someone who is juggling work and family responsibilities? What really matters in the long run? I thought the day could not be better until I sorted through the mail at home. 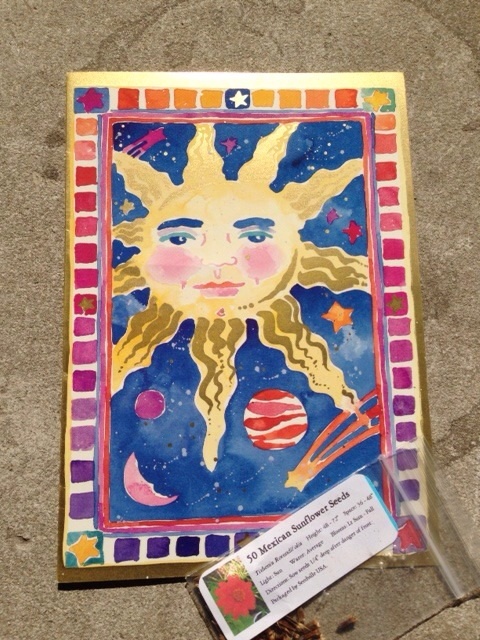 Amidst the fliers for gutter repair and the electric bill I found a colorful card from my friend, Pat, and a small packet of Mexican sunflower seeds. We had each grown them the previous year in our gardens and she had taken time to track down the seeds and send those to me. A simple gift that brought back memories of swallowtail butterflies and the promise of lazy summer days. No multi-tasking allowed. Thanks, Bridget. I always love your blogs!